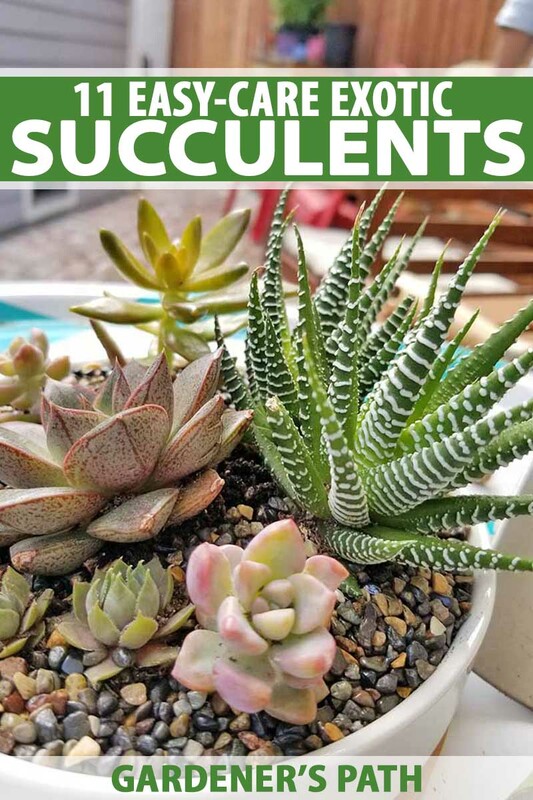 Succulent plants have unusual shapes, rich textures, varied colors, and showy blooms that make a dramatic impact in any container or garden setting. They are not a unique floral family, but diverse members of numerous plant groups. What they have in common is their water-retaining, fleshy leaves and stems. The cactus is one type with which you are probably familiar, but there are loads more! Pot up some favorites to winter over or share with friends, like striped Haworthia; stone-like Lithops; and plump, clustered Sedum. Photo by Allison Sidhu. And don’t worry about your USDA Hardiness Zone. Whether you grow them as annuals in the garden or in pots, there’s something for everyone to love. I adore miniature succulents grouped in pots. They remind me of the exotic sea life of a coral reef, and I never get tired of admiring and fussing over them. 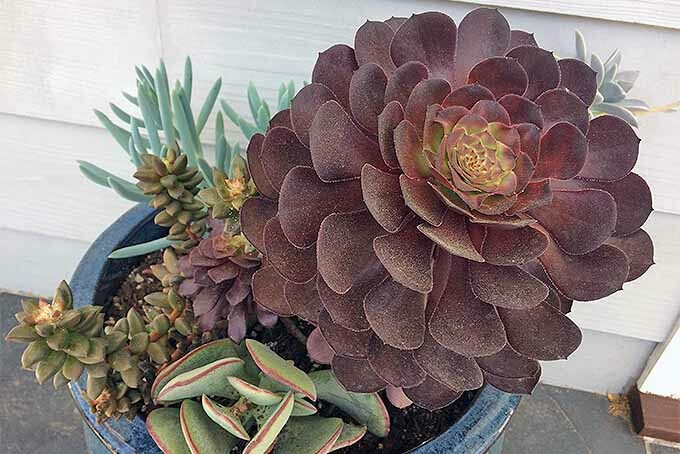 A variety of succulents including a finger-like Senecio, blooming Graptopetalum, rosette of Aeonium, and red-tinged Crassula fills a patio container. Photo by Allison Sidhu. These little varieties are perfect for me because it’s too cold to leave them outside here in the Northeast. If you like larger types, just use containers on wheels and bring them in and out as you like. 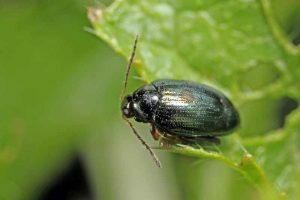 You can also sow directly in the garden in spring, and if you’re in a frost zone, your flora will simply die out when winter comes. 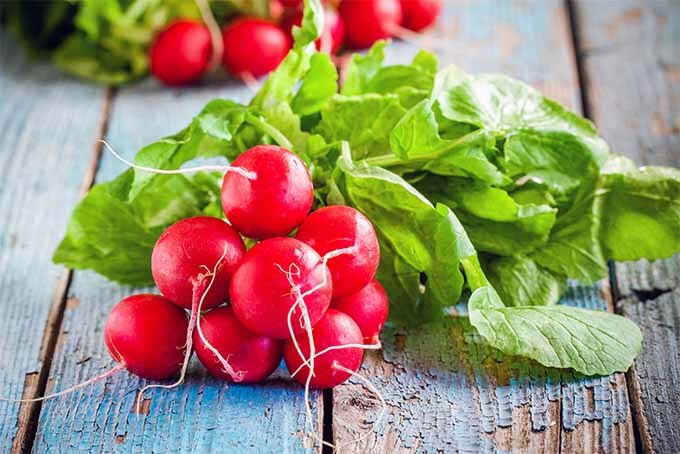 However, unlike typical summer annuals, you can dig these up, pot them, and enjoy them indoors through the winter. 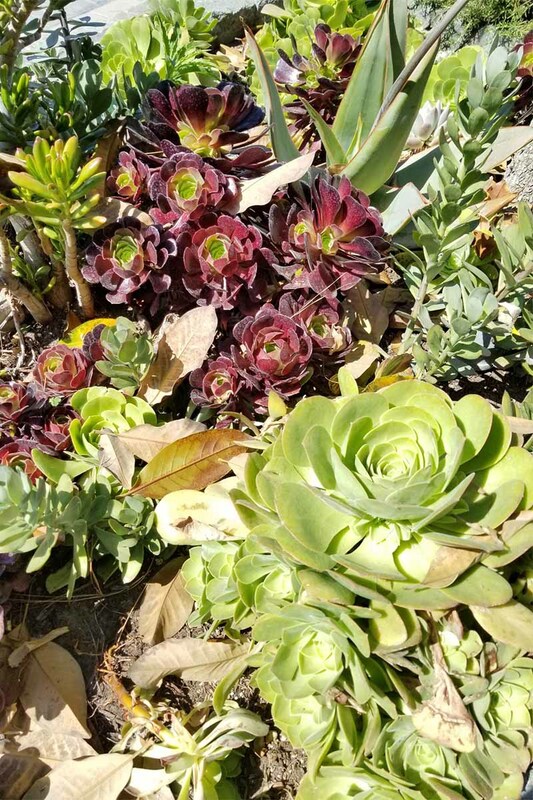 Jade, Aeonium, and Sempervivum form a texturally rich and colorful sidewalk border. Photo by Allison Sidhu. An even easier way to preserve your favorites is to propagate your own plants by taking a small cutting of each to root indoors. 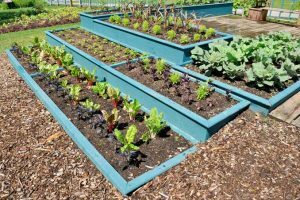 By summer, you’ll have small plants to take out to the garden. Some succulents are perennials. My Sempervivum and Sedum withstand hard frosts and return year after year, spreading to form dense carpets of interest in former “problem areas” plagued by dry, sandy soil. Stay tuned! 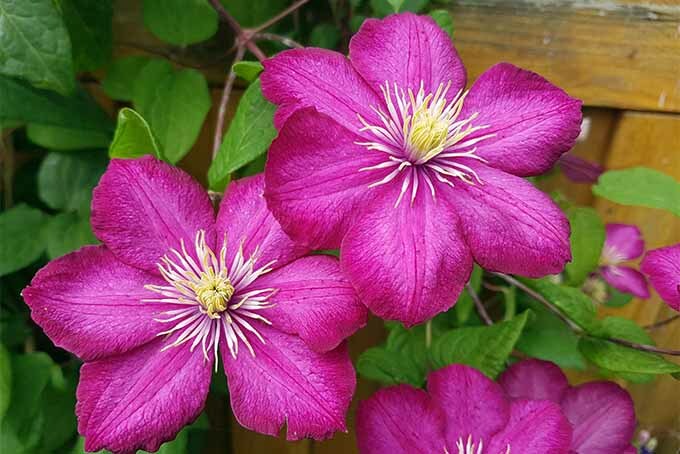 We’ve got eleven eye-catching species just begging for pots on your patio and feature placements among your annuals and perennials. 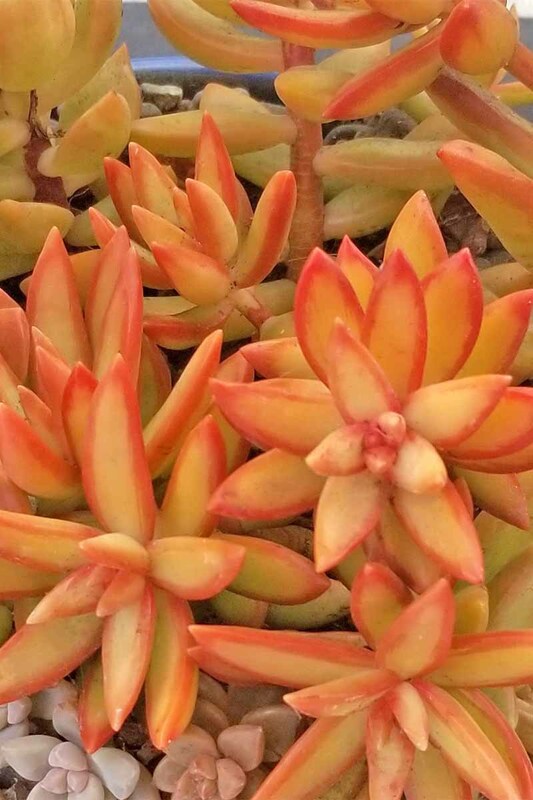 The following eleven succulents come in a vast array of species, subspecies, and cultivars of varied colors, shapes, and textures. From geometric to curvaceous, subtly tinged to boldly striped, they offer an abundance of visually exciting flora with which to design containers and gardens. Aeonium, aka houseleek, bears showy rosettes. The stems may become woody, and some species may exceed three feet in height. 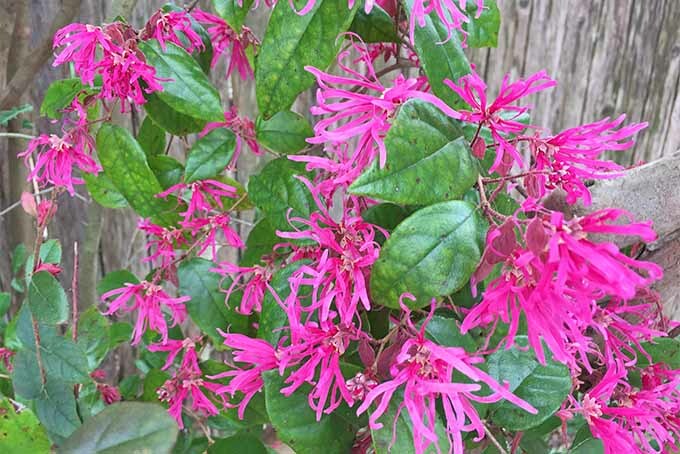 It grows outdoors year-round in zones 9 to 11. Flowers appear from late winter into spring and are usually yellow or white. They may be tall, multi-blossomed cones or diffuse drifts of tiny blooms. 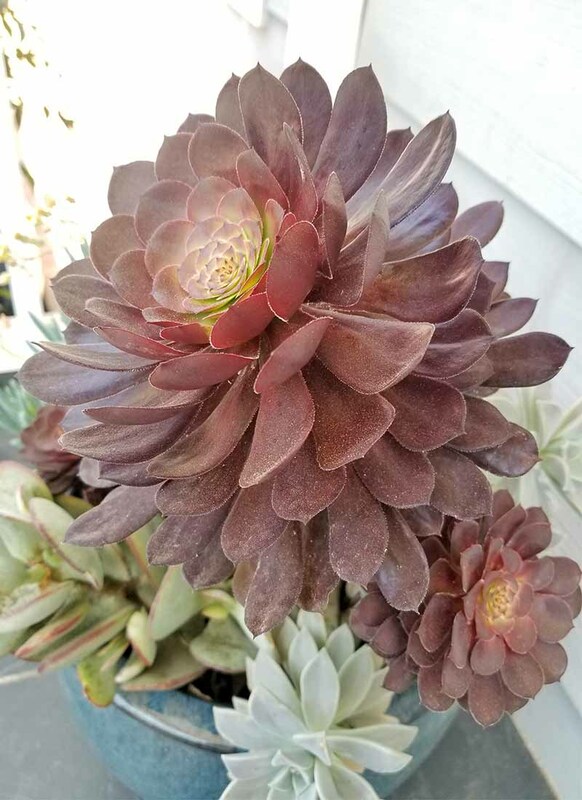 Aeoniums are monocarpic, meaning they die after flowering. But don’t despair! They produce offsets that live on after the parent’s demise. Black rose Aeonium, A. arboreum ‘Zwartkop,’ is a well-known cultivar with glossy leaves that are an almost black shade of burgundy. Another, A. arboreum ‘Kiwi,’ has red-tinged chartreuse leaves, and stalks that top out at two feet. Showy ornamental specimens like these add structure, color, texture, and an alluring and unique flavor to a collection of decorative containers and garden groupings. 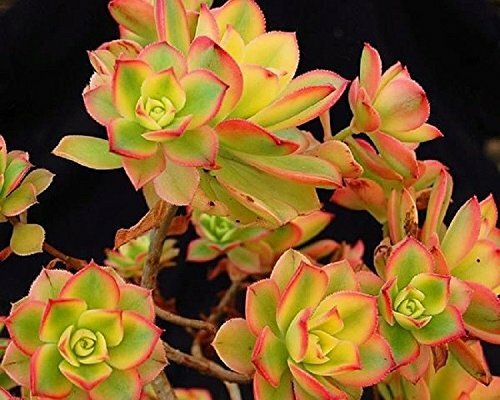 An interesting variety of 10 cuttings, including Aeonium, is available on Amazon. You may also like to purchase an A. arboreum ‘Kiwi’ starter plant in a 2.5-inch pot, also available on Amazon. 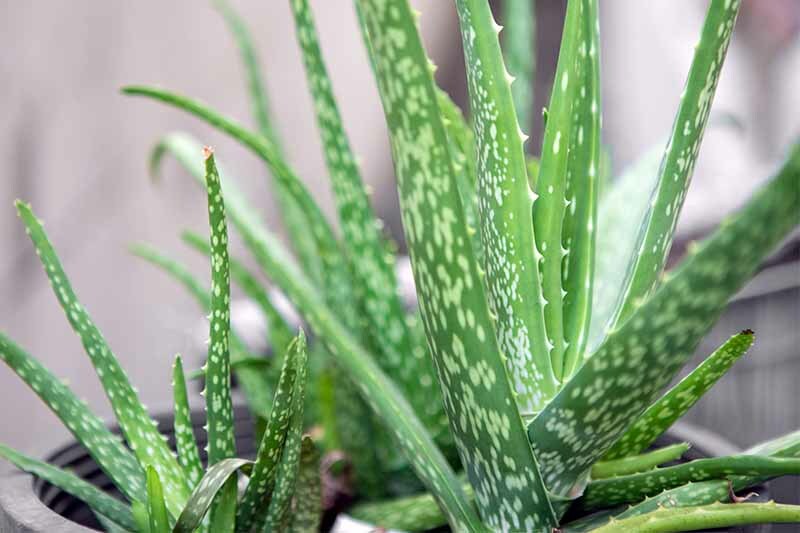 Evergreen medicinal aloe, or Aloe vera, grows year-round in zones 10 to 12, where it reaches a height of up to two feet and produces yellow blossoms in summer. 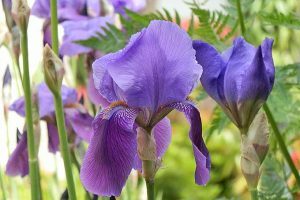 It does best in full sun but may tolerate a bit of shade, and prefers sandy, well-drained soil. 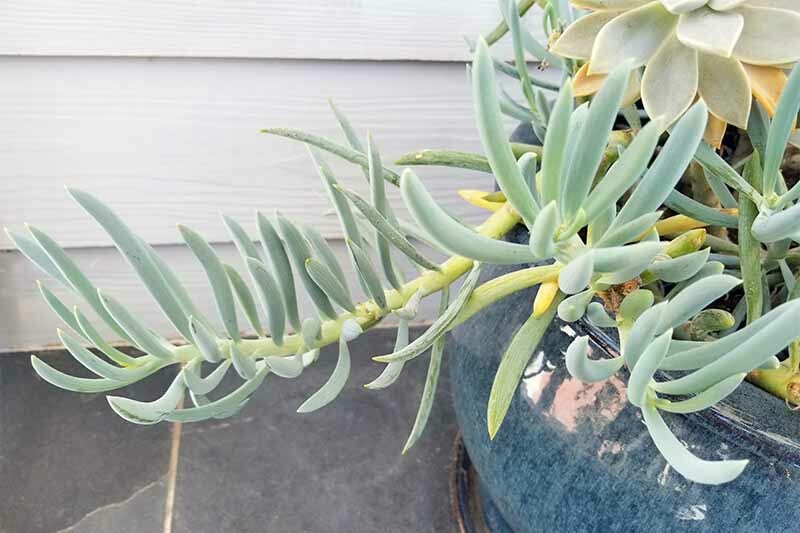 As with most succulents, this one benefits from watering when it dries out during growth and bloom periods, although it tolerates drought well. A. vera’s rosettes of spiky, variegated green and white leaves look attractive in pots that may be moved indoors for the winter. But keep in mind that when grown as a houseplant, aloe seldom blooms. The sap of the fleshy leaves has been prized by healers for centuries, and is a staple ingredient in many commercial lotions. 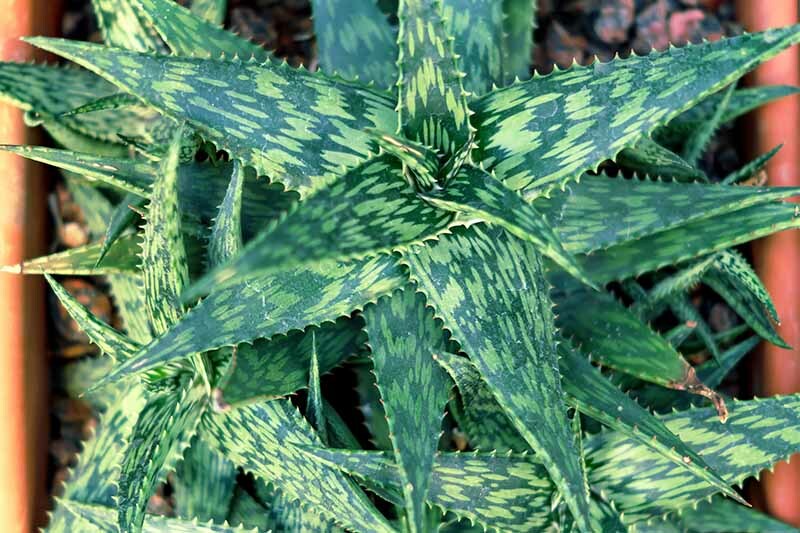 There are many subspecies of aloe, including tiger aloe, A. variegata. 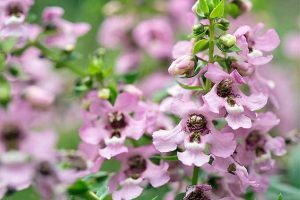 This variety can tolerate more shade, grows to about a foot in height, and has pink flowers that bloom from winter into spring. It is hardy in zones 9 to 11. 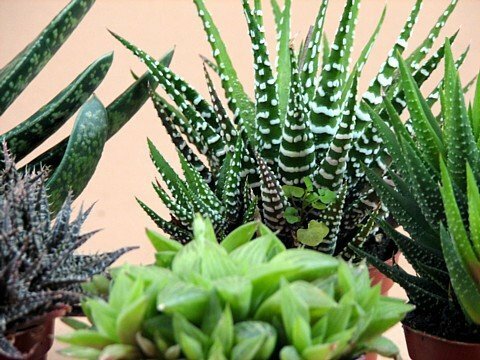 A. vera is available on Amazon in packages of three 8-inch plants in 4-inch pots. The Crassula genus includes the shiny, dark green-leaved jade plant, C. ovata, which you may recognize from your grandma’s house. It’s long been a popular houseplant. 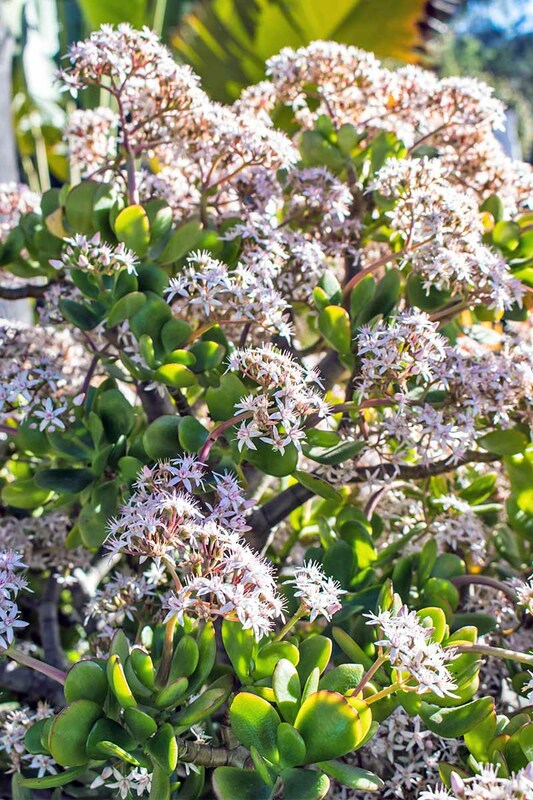 This genus also includes the matte-finished, red-tinged silver jade plant, C. arborescens. 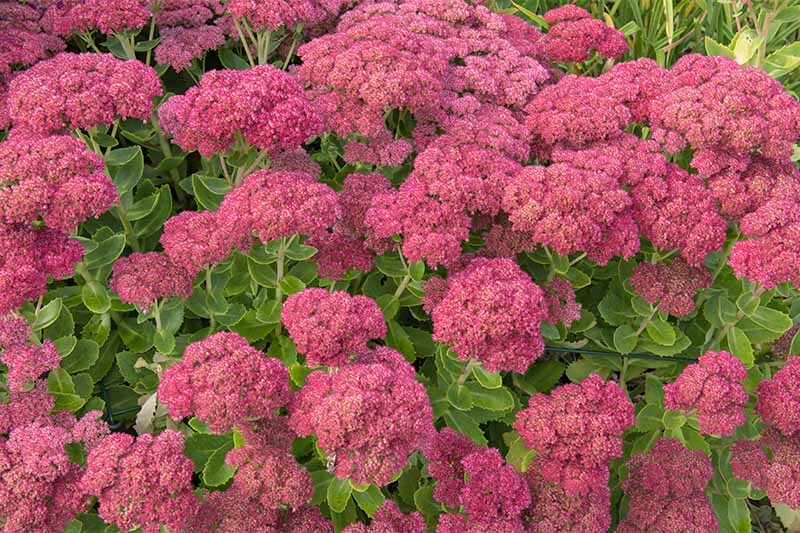 Crassula is an easygoing option that tolerates almost any soil, provided it’s well-draining. 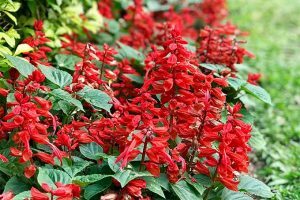 It prefers full sun but tolerates some shade, and is a vigorous grower that thrives outdoors year-round in zones 11 and 12. Silver jade plant, C. arborescens, in a stylish silver pot. Photo by Allison Sidhu. 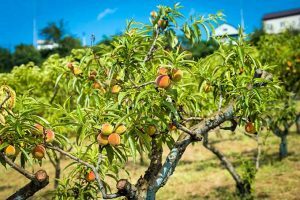 Left to its own devices in pots or gardens, this gem may reach a shrubby five or six feet tall with branching trunks and fleshy, paddle-like leaves. Use its towering presence as a linear focal point to draw the eye upward, creating drama in a container or garden bed. Crassula grown in pots of manageable size benefit from fresh potting each spring, and a top-up of appropriate cactus/succulent soil. No fertilizer is required, but you may sparingly apply a slow-release type if desired. Indoor plants seldom bloom, but outdoors, expect clusters of tiny white or pink blossoms from late fall into early winter. 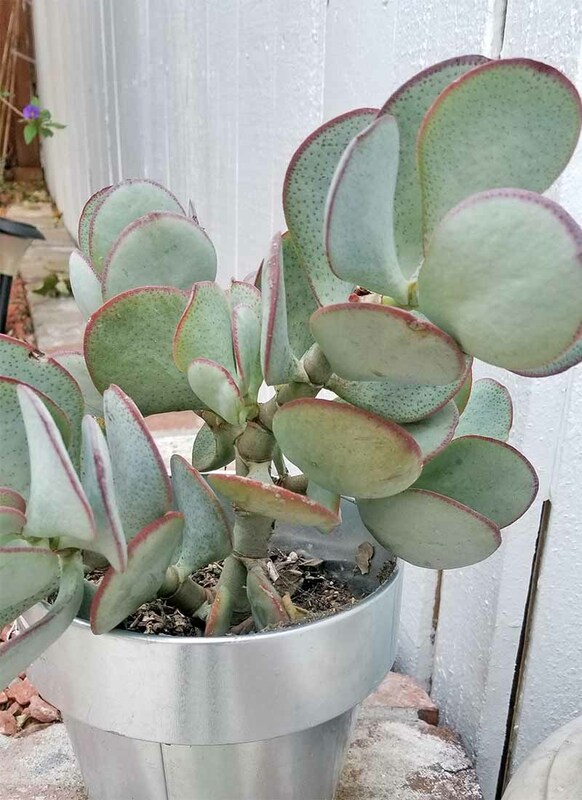 Jade plant, C. ovata, is available on Amazon in 6-inch pots. 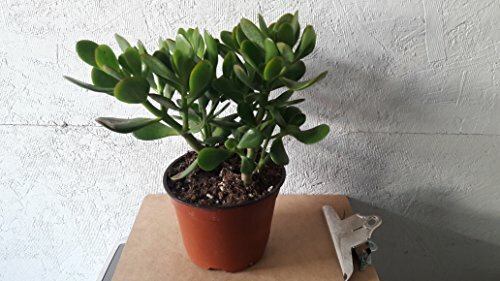 Silver jade plant, C. arborescens, is available on Amazon in 3.5-inch pots. The Echeveria genus is large and varied, and often serves (sometimes erroneously) as a catch-all category for any rosette of uncertain definition. It is part of the stonecrop family, Crassulaceae. Echeveria rosettes represent this group’s wide variety. Species exhibit a classic rosette shape, and an astounding array of leaf attributes. Evergreen leaves come in a palette of hues, and flowers of all colors perch atop delicate stems. Hardy in zones 9 to 12, Echeveria will do nicely potted up in any region. Provide full sun to part shade and sandy, well-drained soil. 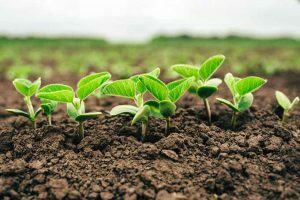 Fertilizer is not necessary, but if you must, use a low-nitrogen, slow-release variety. And when you water, sprinkle the soil, not the leaves, to protect the waxy coating and inhibit rotting. 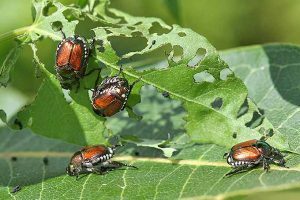 Depending upon the variety, it may be a low-growing groundcover or a saucer-sized rosette on a two-foot stalk. You may prune leggy plants and root the cuttings. Some people “behead,” these, chopping an entire rosette from a leggy stem. With luck, the stem will continue to grow, and the cut rosette will root successfully. 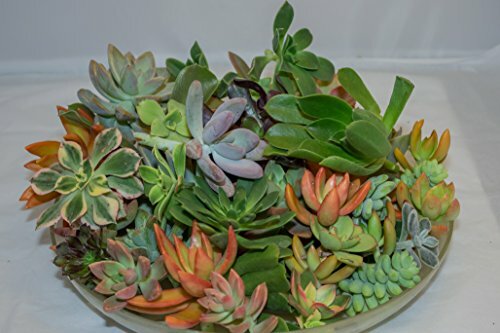 Often, when you order succulents online, you’ll receive a mix of unidentified cuttings or small specimens. Generally, at least one is an Echeveria. Echeveria, fresh out of the delivery box. Photo by Allison Sidhu. I take the advice of Patrick Grubbs of Sublime Succulents. 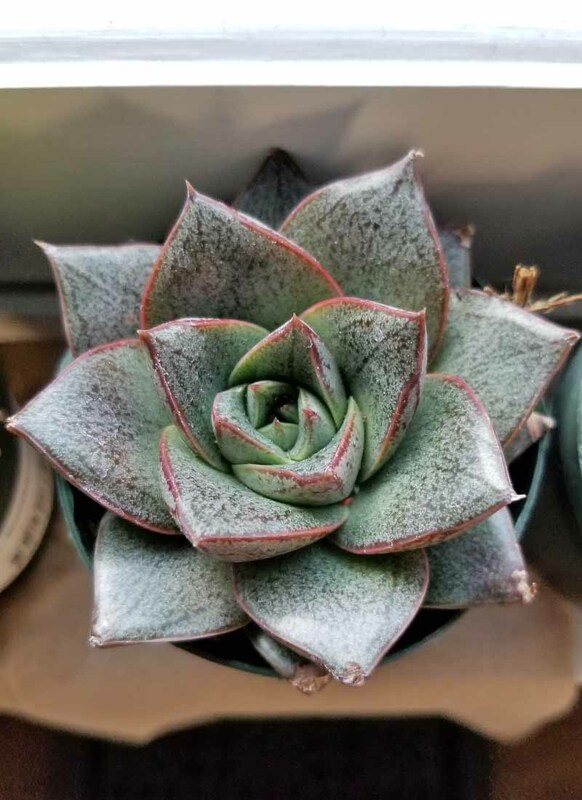 Echeveria are often mistaken for Sempervivum because both are rosette-shaped, and produce offsets of parent plants that spread densely. 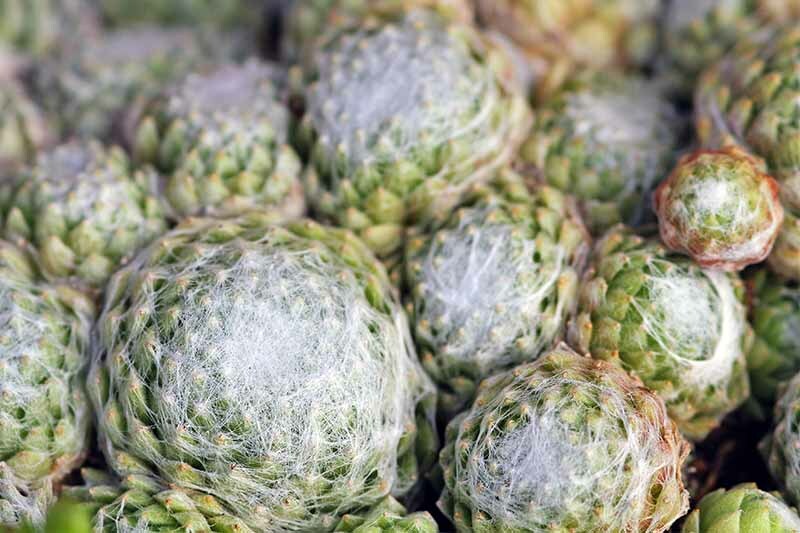 Texture – Echeveria is never furry, but Sempervivum may be. Plumpness – Echeveria leaves are usually thick, Sempervivum may be thin. Blossoming Style – Echeveria send up slender stems, and Sempervivum blossoms rise from an elongated rosette. Perhaps the best way to tell is to see if it can withstand frost. If you’re in a cold zone like me, take cuttings of your favorites to pot up, and leave the rest outside for the winter. If the latter come up again in the spring, they’re not Echeveria, but Sempervivum! Otherwise, watch what happens at bloom time. Echeveria is polycarpic, meaning it flowers and lives on after the blooms fade. Sempervivum, on the other hand, is monocarpic, flowering and then dying, leaving its offsets to carry on. 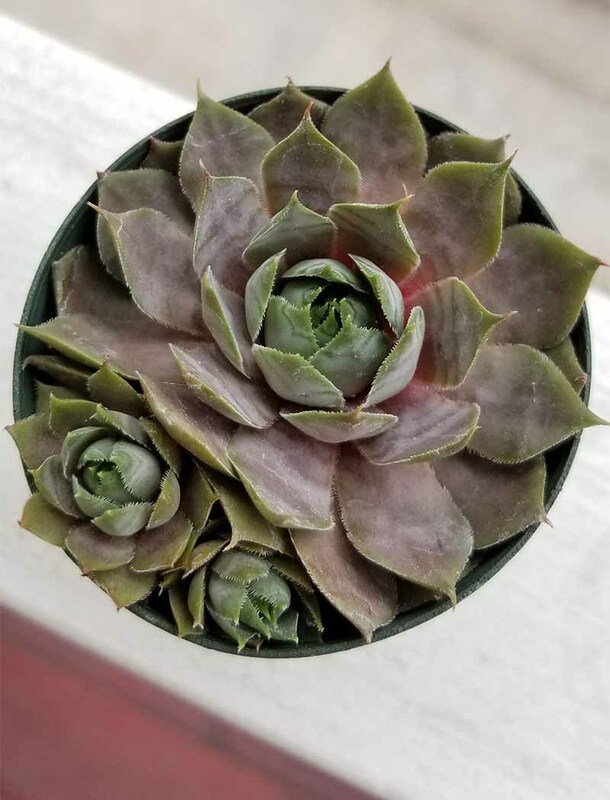 One type of Echeveria that’s often mistaken for Sempervivum is E. glauca, commonly known as blue hen and chicks. It produces slender-stalked blossoms of yellow with red accents from spring into summer. 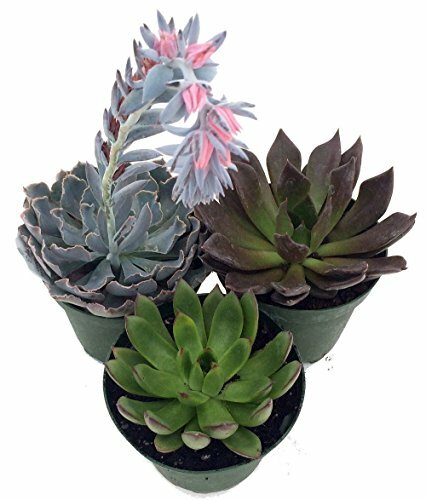 An assortment of three Echeveria in 3-inch pots is available on Amazon. 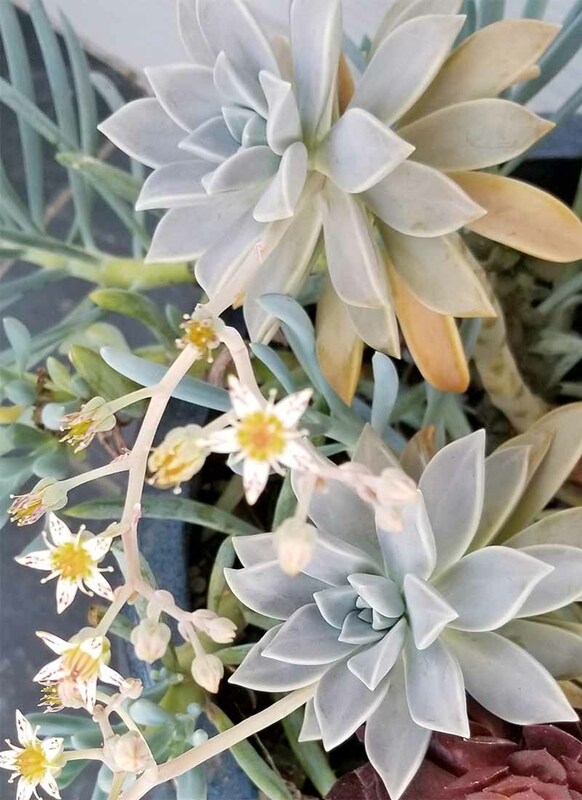 Graptopetalum is a genus of rosettes that grow as perennials in zones 7 to 11. Also members of the Crassulaceae family, ghost plant, G. paraguayense, is one of numerous species. Ghost plant, G. paraguayense, in full bloom. Photo by Allison Sidhu. In full sun, leaves are faintly pink, but in part shade they take on a gray-green hue. 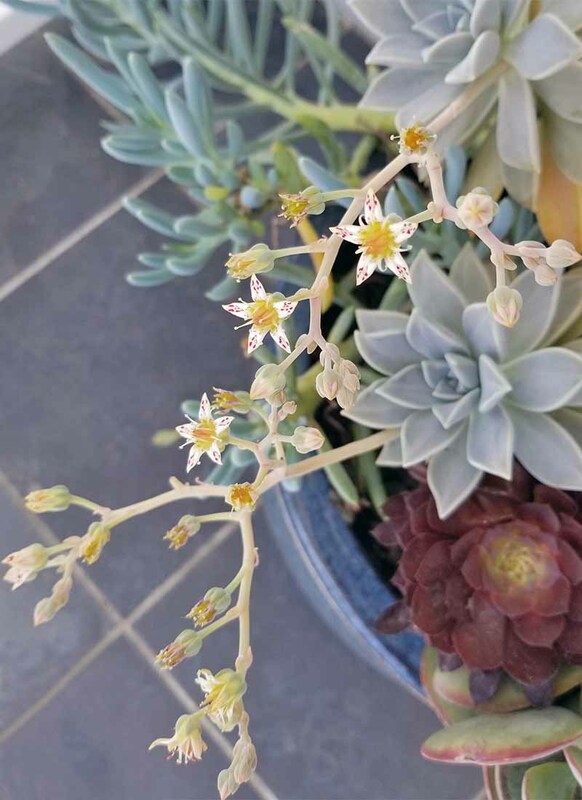 Graptopetalum grows well in sandy, well-drained soil with little moisture, but appreciates watering when it dries out completely during growth and bloom times. When it is grown outdoors in spring, tiny white star-like flowers with red accents form on slender stalks. This is a rambler, so rocky hillsides and hanging pots are perfect planting locations. However, allowing it free range may make it scraggly. Prune off leggy stalks for a more compact appearance. Unlike evergreen succulents, Graptopetalum drops leaves. While a little messy, the leaves take root very easily, making for some of the easiest self-propagation ever. If you’re growing it in a hanging container, simply place a large catch-all pan of cactus/succulent potting medium beneath it to catch what falls. G. paraguayense cuttings are available on Amazon in packages of ten. 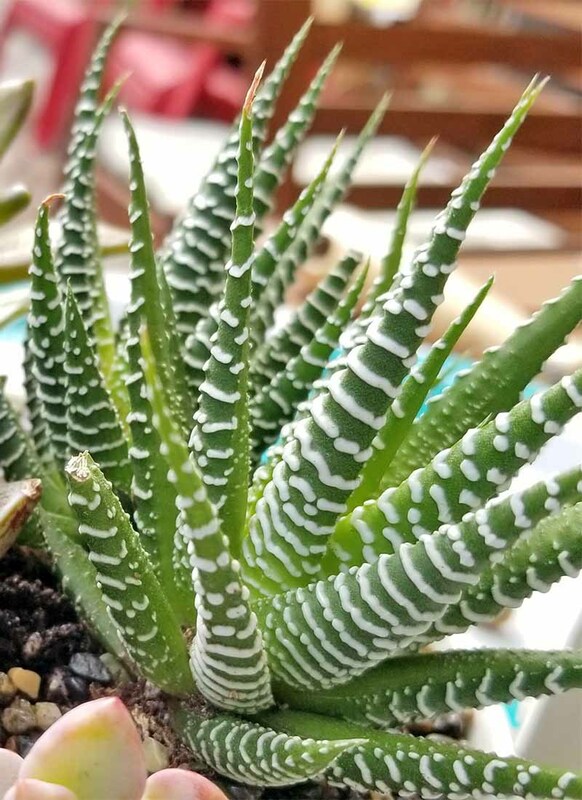 Haworthia is an elongated, fleshy rosette that resembles aloe. Wart-like bands of white on dark evergreen leaves give a mottled look to H. margaritifera, and a striped appearance to zebra plant, H. fasciata. Zebra plant, H. fasciata, shares a pot with sedum. Photo by Allison Sidhu. There are numerous species in this family, some with leaves so plump and shiny they’re fit to burst. 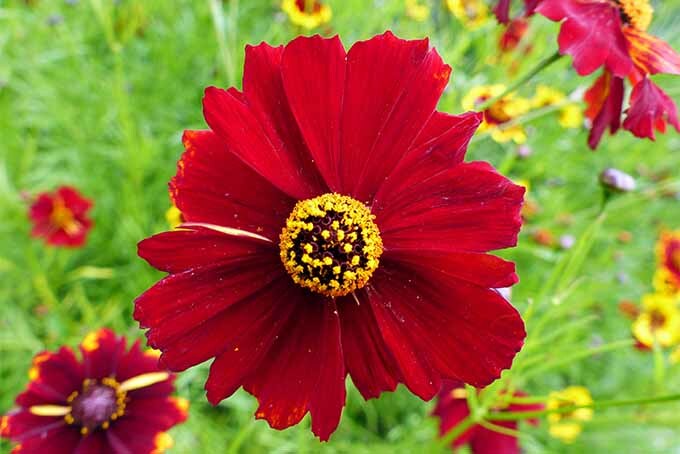 It thrives in full sun and sandy, well-drained soil. 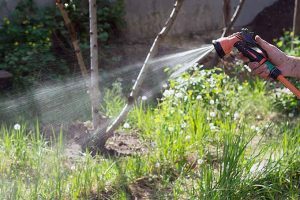 Water and apply a diluted or slow-release fertilizer during growth and bloom periods. Most Haworthia rosettes remain shorter than six inches in height, but flower stalks may rise a foot or more above the base leaves. Grow this succulent outdoors year-round in zones 9 to 11, or in containers that may be moved indoors for winter. Check houseplants in spring, and repot as needed to maintain adequate space for expanding and multiplying rosettes. 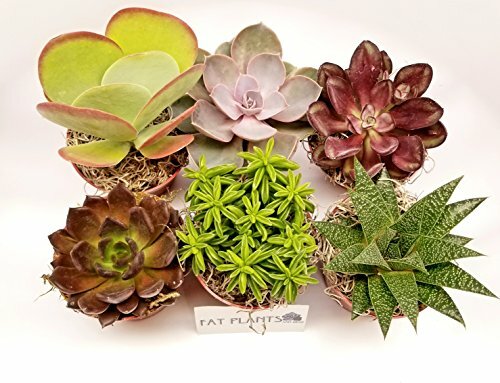 A collection of five assorted Haworthia in three-inch pots is available on Amazon. I think Lithops, often called living stones, is one of the most unusual succulents. The one you are likely to find for sale is L. bella. 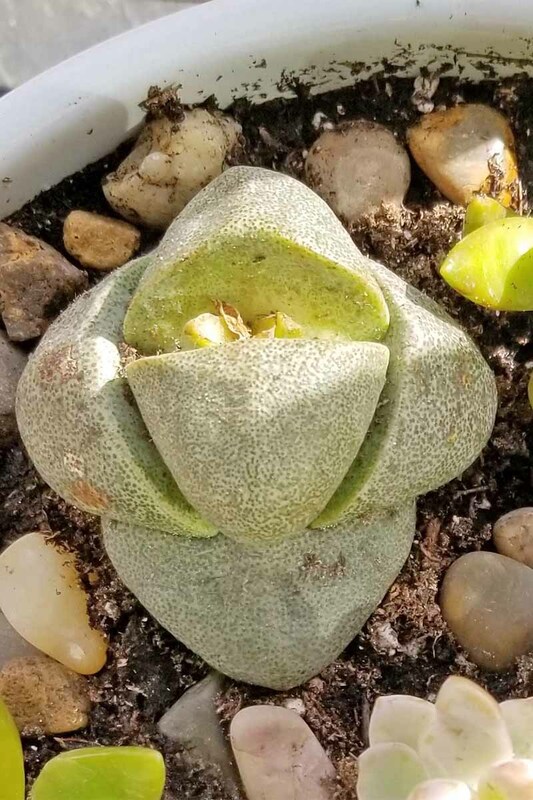 Living stone, or Lithops, is at home in a container with pebble-topped soil and other varieties. Photo by Allison Sidhu. In the wild it grows mostly underground, exposing only the tips of its leaves to absorb what little moisture is available. Topping out at about an inch and a half, it displays the color striations and smooth surfaces of rock, betrayed only by the lush, white or yellow daisy-like flowers that emerge from its fissured center. Grow lithops in shallow pots, or in the garden where it spreads densely, creating an earthy, textural mosaic of browns, greens, and blues. It craves gravelly, well-drained soil and full sun, and may be enjoyed year-round in zones 10 and 11. The water requirements for this variety are low. During winter dormancy, it requires almost none. 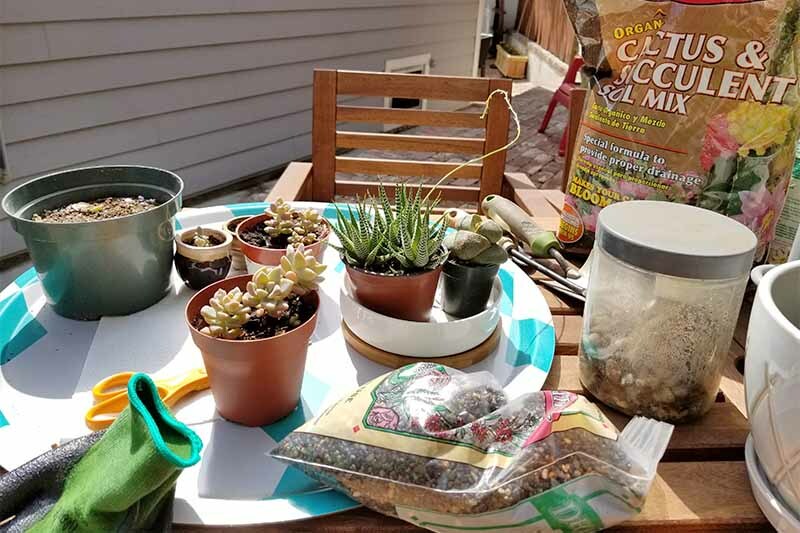 However, during the emergence of new leaves and/or flowers, water each time the well-drained cactus/succulent potting medium or gritty soil dries out completely. 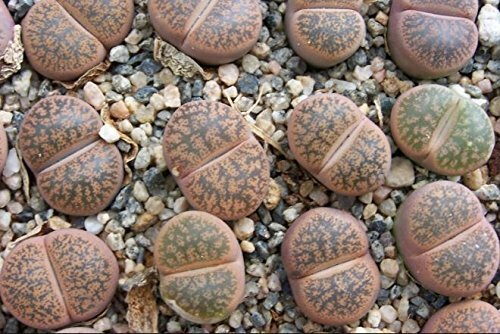 Lithops is available on Amazon in 3-inch pots. 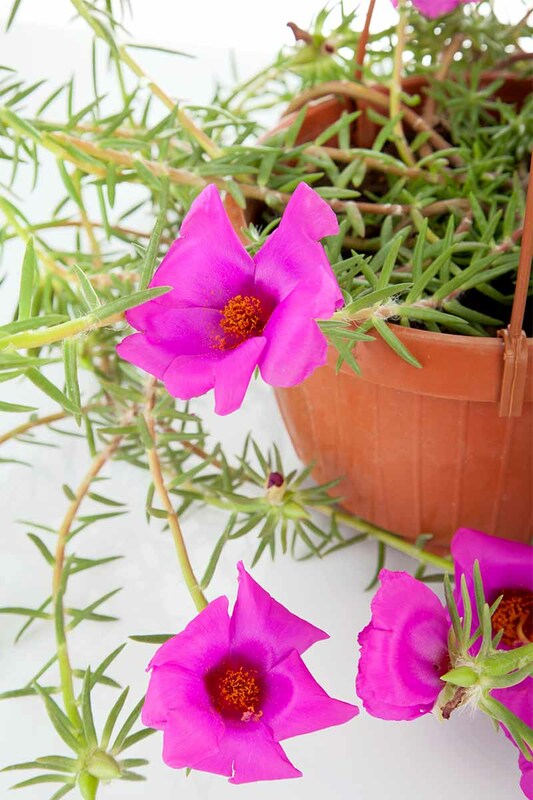 Portulaca grandiflora, commonly known as moss rose, is an annual that thrives on neglect. Moss rose, P. grandiflora, trails over the rim of a hanging pot. Give it full sun and room to roam, and it will tolerate even the driest of soils. 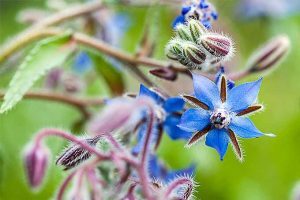 This half-hardy annual can’t tolerate the cold, so start seeds indoors in early spring and sow seedlings outside after the danger of frost has passed. 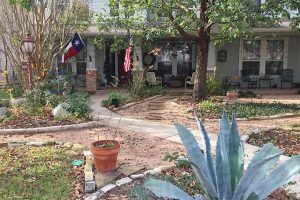 Ideal accommodations include gritty, well-drained soil, and water only when leaves droop. 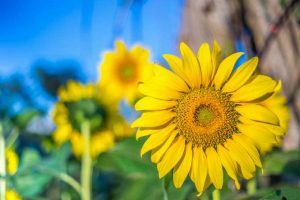 In return, expect lots of bright, showy blooms that boast single or double rows of petals in a range of colors from yellow to hot pink. Narrow, fleshy leaves resemble pine needles and grow on trailing stems that are lovely in hanging pots and rock gardens. This flower is one of my childhood favorites, and is often overlooked by “serious” gardeners. It’s a fun plant for kids because unless they kill it with kindness, à la too much water, it’s almost foolproof. There are numerous cultivars which bloom profusely from June through September. No fertilizer is required. Portulaca is intended for the garden or outdoor containers, where it will live for one season. It is not a houseplant. 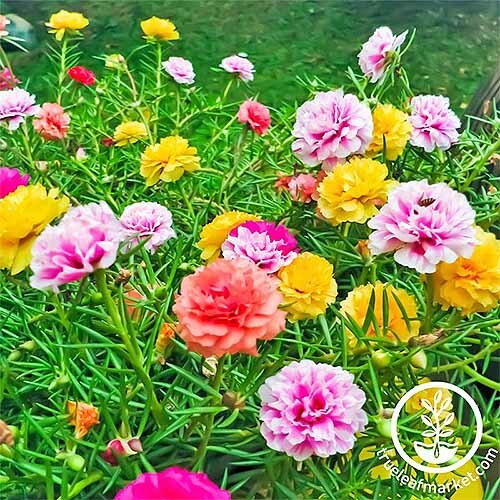 Mixed double Portulaca seeds are available from True Leaf Market. They grow as annuals in zones 5 to 11 and are perfect for containers. Another Portulaca with which you may be familiar is P. oleracea, or common purslane. This is an edible wildflower with succulent leaves and tiny yellow flowers that has naturalized in the US from unknown ancient origins. Like me, you may find it sprawling in bare ground in your landscape. 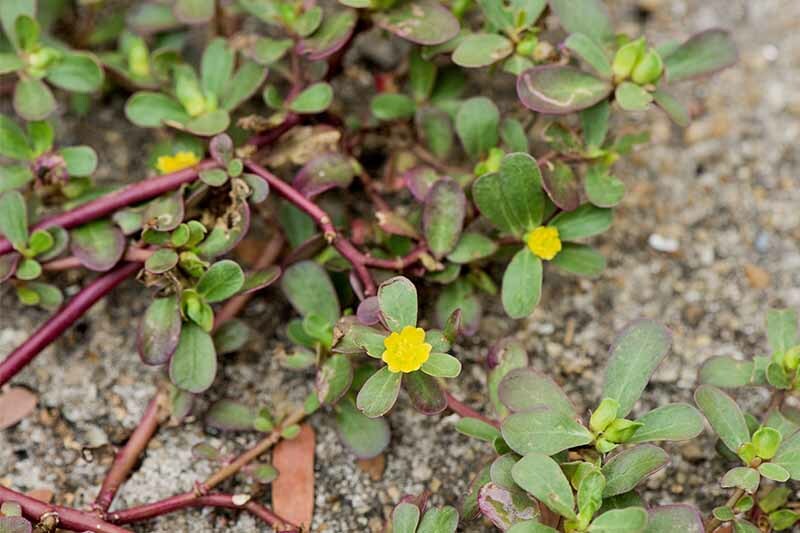 And, while many call it a weed and consider it to be a nuisance, purslane is in fact a useful groundcover that’s rich in nutritious omega-3 fatty acids! Please note: Apart from the above-mentioned purslane, P. oleracea, the succulent plants discussed here are for ornamental use only as they may contain toxins that are harmful if ingested. 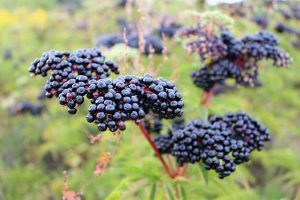 And be careful when foraging, since many common edible plants have potentially toxic lookalikes. 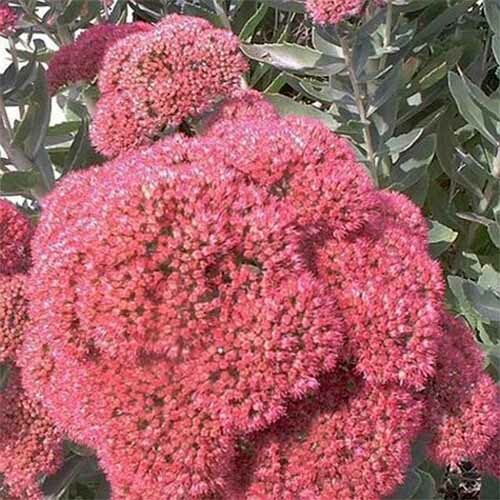 Sedum is an expansive flowering succulent variety, another genus belonging to the huge Crassulaceae family. 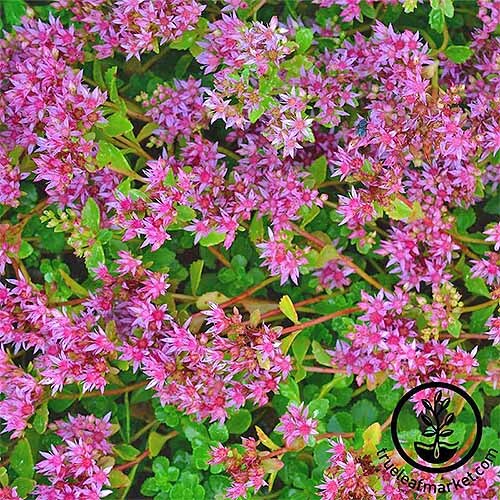 Often referred to as stonecrop, some are evergreen perennials that will grow to be two feet tall, like S. spectabile ‘Autumn Joy,’ with its eye-catching deep pink flowers that bloom from late summer through fall. Others, like coppertone sedum, S. nussbaumeranum, are low-growing perennial groundcovers that add tons of textural interest with their quirky shapes and hues, with occasional frothy white flower clusters. Fiery coppertone sedum, S. nussbaumeranum. Photo by Allison Sidhu. Sedum thrives in full sun in sandy, well-drained soil. 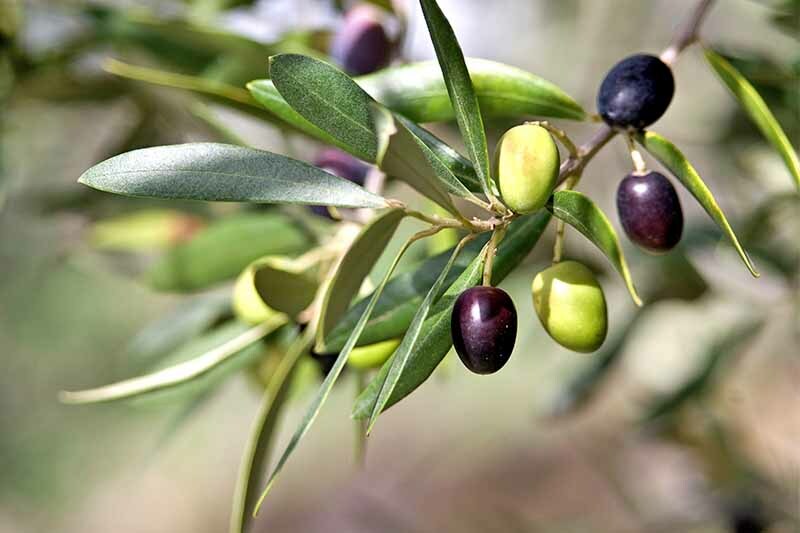 Its fleshy leaves and stems are amazing water reservoirs, so only water when the soil is bone dry. It will tolerate some shade, but its preference is to bask in bright daylight. 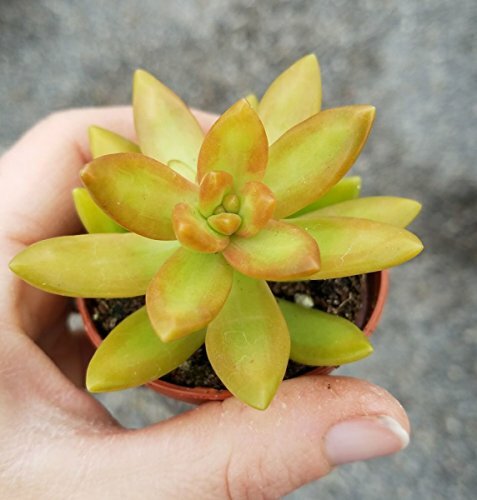 Coppertone stonecrop, S. nussbaumeranum is available on Amazon in 2.5-inch pots. Each should reach a height of 8 to 12 inches. S. spectabile ‘Autumn Joy’ is available from Nature Hills Nursery in #1 containers of approximately 2.3 to 3.7 quarts. S. spurium ‘Dragon’s Blood’ seeds are available from True Leaf Market in packages of 1000. 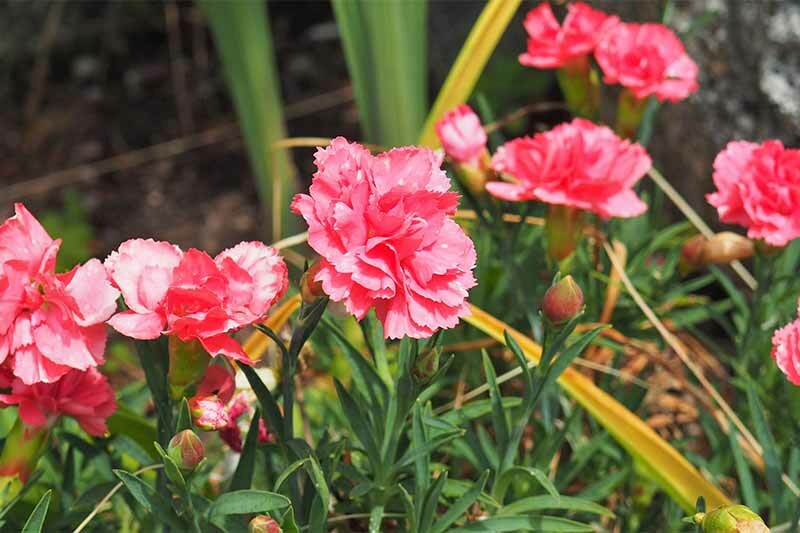 Plants top out at 4 to 6 inches with starburst blooms of vivid pink, and are perennial in zones 3 to 9. 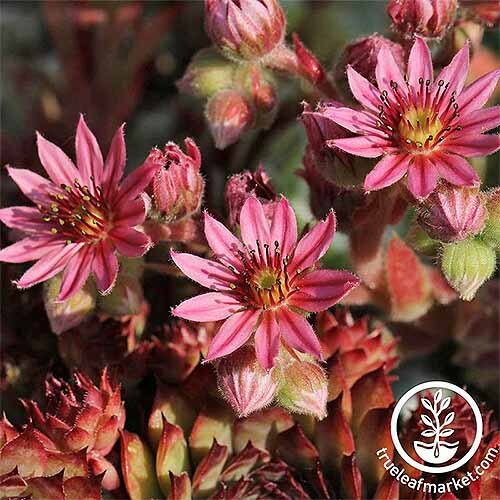 Closely related to sedum is Sempervivum. Its perennial, evergreen rosettes are the mainstay of rock gardens in zones 3 to 6, and often all the way to zone 8. This is one of my favorites here in northeast Pennsylvania, with an array of choices ranging from one to twelve inches in height. S. tectorum hen with chicks. Photo by Allison Sidhu. Perhaps the best known is S. tectorum, aka hen and chicks, or houseleek (also a common name of Aeonium). It’s remarkable for the proliferation of tiny replicas of itself that mature and spread densely. 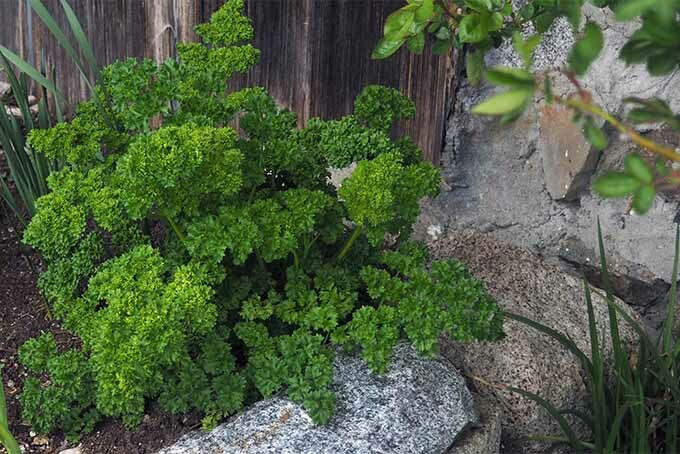 This is a useful and attractive groundcover choice for dry problem areas, like those along suburban sidewalks. It’s also a popular selection for roof gardens and rock walls. Another is S. arachnoideum, the cobweb version of hen and chicks. White filaments cover the top of each rosette as though a spider was busy spinning many, many webs. There’s always something funky to find with succulents! Sempervivum thrives on neglect, and requires almost no watering. Simply provide sandy, well-drained soil and full sun, and it is in its element. 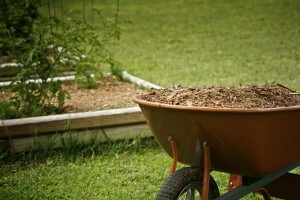 If you garden in a northern climate, apply some mulch in early fall for an added layer of warmth. Keep in mind that Sempervivum is monocarpal, and each hen dies after flowering. However, its chicks carry on from there. Seeds are available from True Leaf Market in packages of 1,000. The Senecio genus is a large one that includes blue chalk stick, S. serpens, and string of pearls, S. rowleyanus. Both species do well in full sun to partial shade, with sandy, well-drained soil and minimal water. A leggy blue chalk stick, S. serpens, exhibits some signs of overwatering and low light, and mingles with ghost plant, G. paraguayense. Photo by Allison Sidhu. In a pot, string of pearls cascades in jewel-laden vines. On the ground, it makes a dense covering, as creeping stems root themselves. While the flowers are tiny, they are fragrant, long-lasting, and striking, with long stamens protruding from white blossoms. This unusual variety may reach up to two feet in length. 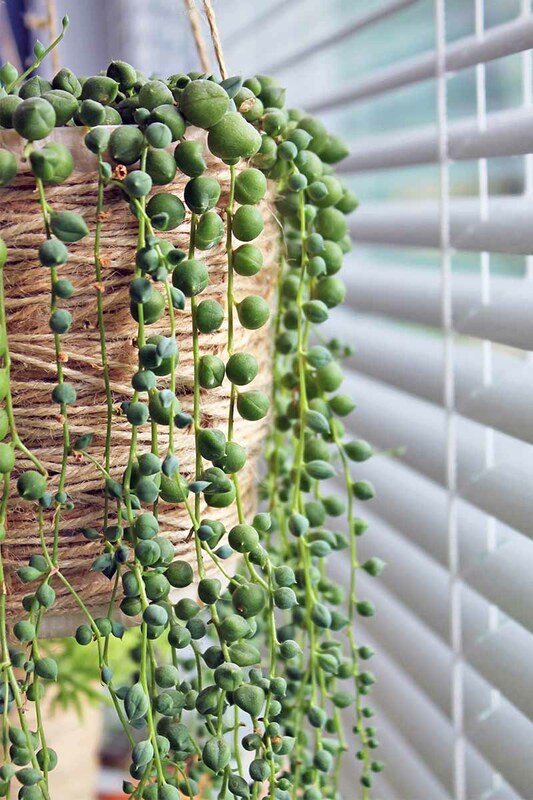 String of pearls is perfect for hanging planters. Enjoy string of pearls year-round in the garden in zones 9 to 12. If you pot it, refresh the pot each spring, increasing in size as needed, topping up with fresh cactus/succulent potting medium, and a diluted or modest application of low-release fertilizer as desired. Too much fertilizer may make some succulents leggy when they should be compact, so over-fertilizing should be avoided. 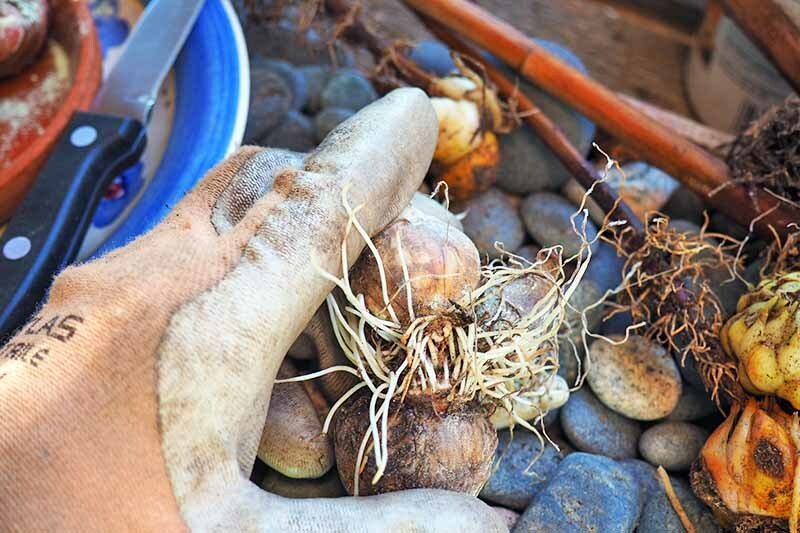 If a plant becomes root bound, or very old, it may be best to take cuttings and start fresh. 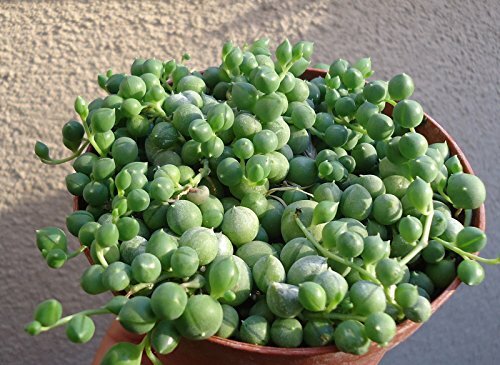 String of pearls, S. rowleyanus, is available on Amazon in 4-inch pots. 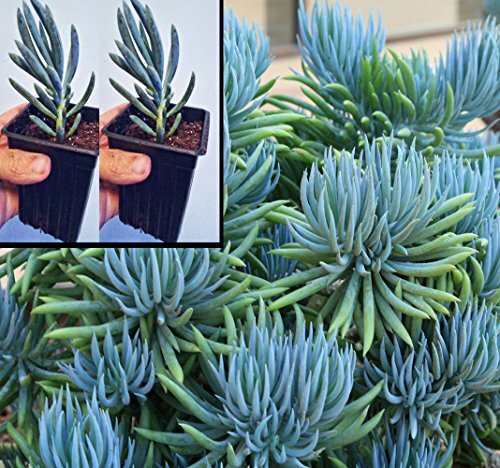 Blue chalk stick produces dusky blue finger-like leaves and stretches to a foot in length if given the opportunity. To keep it more compact, prune off leggy stems and root them if you like. Grow it year-round in the garden in zones 10 and 11, and enjoy tuft-like, yellowish fragrant blossoms in spring. Blue chalk stick is a bit temperamental when it comes to propagation. We haven’t had much luck in my family. 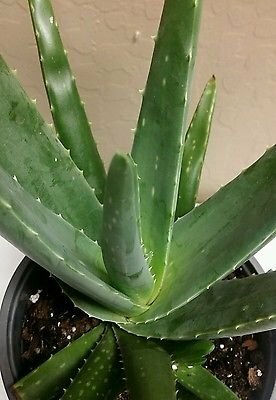 You may try dipping a fresh, wet leaf or leaf/stem cutting into a powdered rooting hormone before placing it into sandy, well-drained cactus/succulent potting medium, or gritty soil. Blue chalk stick, S. serpens ‘Mandraliscae,’ is available on Amazon. You will receive two 2.5-inch pots. 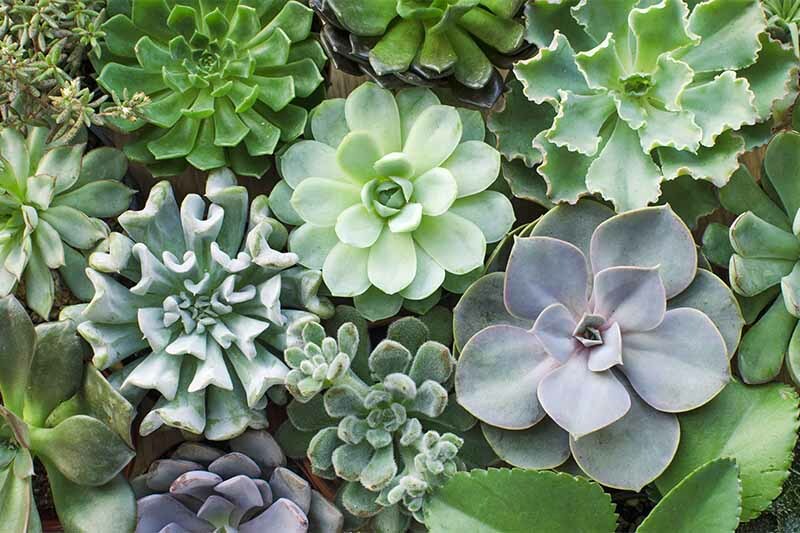 With so many succulents to choose from, you’re sure to find a new favorite (or two, or ten…) on our list. And you’re ready to plant, now that you know a little more about the specifics on each. For more of our top tips to become a succulent gardening pro, be sure to check out our expert guide! 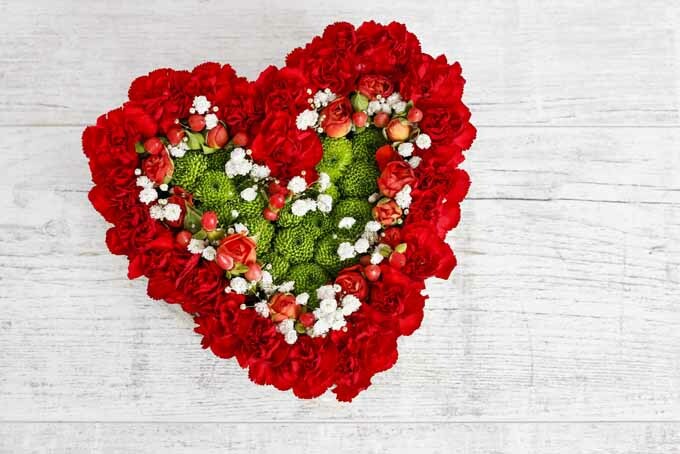 If you decide that you ordered a few too many, or you found a sale at the local garden center and went a little crazy (we can’t blame you), why not give some away as party favors at your next get-together? (Here’s a mixed variety of six that’s available on Amazon that would be perfect for this…). 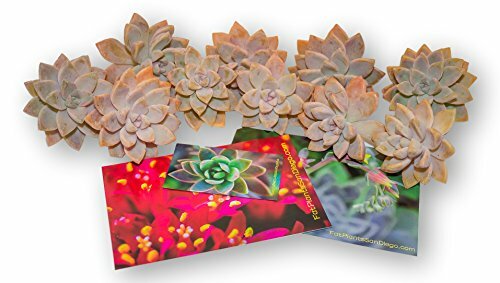 Don’t hesitate to jump into the amazing world of growing succulent plants. Will you add a few to your houseplant collection on the kitchen windowsill, or will you go all in with a rock garden full of perennial Sempervivum and Sedum? We can’t wait to hear all about your new garden passion in the comments section below! Photos by Allison Sidhu © Ask the Experts, LLC. ALL RIGHTS RESERVED. See our TOS for more details. Product photos via Fat Plants San Diego, Mabes Warehouse, JM Bamboo, Iniloplant, Hirt’s Gardens, South Texas Succulents, True Leaf Market, Nature Hills Nursery, CTS Air Plants. Uncredited photos: Shutterstock. With additional writing and editing by Allison Sidhu. I’ve been meaning to try my hand to grow succulents again. This post is a great resource for all the varieties out there. Thank you. I’m embarrassed to admit this but I actually ended up killing the succulents I had and I only watered them about once a week. Do you have an ideal time frame of how often I should water the new batch of succulents? Your blog has given me the insight I needed and I now have a few lovely succulents in my house again. I am using the chopstick method you pointed out and it’s been working so far. Thank you so much!